Along the shoreline of Flowerpot Island in Fathom Five National Marine Park in Ontario, Canada, a tourist stands next to a sea stack, a natural phenomenon constantly changing. 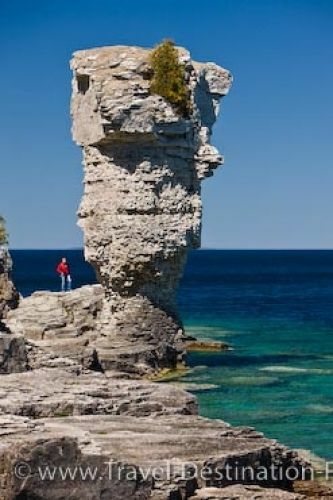 There are two sea stacks on Flowerpot Island and can easily be viewed from the water but some tourists like to hike the area to get a closer look. One sea stack stands at a height of 23 feet while the other towers above at 39 feet. These sea stacks received their name as they are similar in shape to a flowerpot which have been created from the wind, water and storms passing over Lake Huron in Fathom Five National Marine Park. The limestone rocks or sea stacks have become a popular tourist attraction and the area is protected from fishing and development. Other things to see while on Flowerpot Island are the caves, forests and high cliffs which look out over Lake Huron. Picture of a tourist beside a sea stack on Flowerpot Island in Fathom Five National Marine Park. Sea Stack along the shoreline of Flowerpot Island in the Fathom Five National Marine Park, Lake Huron, Ontario, Canada. Model Released.